Located in the Plateau Mont-Royal on Clark Street, this 1-bed and 1-bath loft-style condo is 1,000 sq. ft. and features exposed brick, hardwood floors, gas fireplace, and Juliette balcony. Building amenities includes an elevator and a rooftop terrace. Rent this furnished condo in the Plateau and find everything you need for a comfortable stay in the city. The luminous, open-concept living space offers a sunny den area, completed with gas-burning fireplace and wall-mounted flat screen television, a personal work desk, and a queen-sized bed. The modern, eat-in kitchen is fully-equipped with a 6-person dining table, stainless steel appliances, and fitted cabinetry stocked with gourmet cookware. Entertain friends and family thanks to a separate mini-bar located near the entrance, including a beer fridge, a sink, and bar stools. A spacious bathroom provides double vanity, a soaker bathtub, a separate walk-in shower, and designer finishes. Unit #1030 also includes unlimited high-speed Wi-Fi internet, free local calls, and a concealed laundry closet for your added convenience. 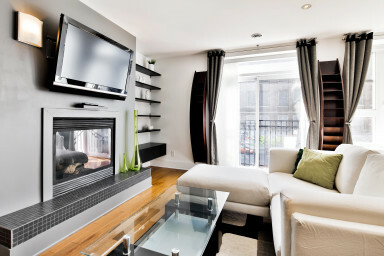 Simplissimmo makes finding luxury accommodation in the heart of Montreal simple! The 4-storey 4247 Clark is a fully-renovated, 11-unit residential building located in the Plateau. Residents staying here have exclusive access to a shared, panoramic rooftop terrace with views of the mountain. Located in the center of all the action, the Plateau Mont-Royal is widely considered as being the trendiest and most walkable neighbourhood in the city! This address conveniently puts you on a quiet street within close proximity to all necessary services and facilities. Start your day by grabbing coffee at the popular Café Névé before strolling up Mount Royal for one of the best views of the city. For a healthy lunch, head over to Aux Vivre’s delicious vegan counter, or brave the line-up outside Schwartz’s for a legendary smoked-meat sandwich. After you’ve finished browsing the many boutiques along Montreal’s vibrant Mont Royal Avenue, treat yourself to a fine cut of steak at Moishes, and then look no further than Saint-Laurent Boulevard to experience the city’s electrifying nightlife. Big in Japan Bar and Le Réservoir offers something a little more refined, while further down the street check out the Blue Dog Motel, Blizzarts, Tokyo Bar or Apt. 200 to dance the night away. Live like a local, stay in the Plateau!